When you need reliable storefront installation and window repair services in Essex and Morris Counties along with the surrounding area, look no further than House of Glass. We are committed to providing you with the highest quality services completed affordably and quickly. Since 1989 we have helped dozens of businesses such as JC Penney and GNC with design and implementation of storefront doors and windows. For immediate consultation, call now at 973-674-4228. While every glass project will be as unique as the building it is attached to, there are several steps that are common on most of our work. If your needs include storefront door or window repairs, House of Glass has you covered. We’ll come out to inspect the problem, give you a fast and accurate quote and get to work right away. Our expansive shop is located within minutes of most businesses in Newark and Essex County, NJ so we are ready to handle emergency repairs too. From installing sill and sill flashing components to fabrication, you can be certain to receive extraordinary services and great results. We’ll take great care while taking measurements and will make sure that the construction complies with the contract document and architectural drawings. 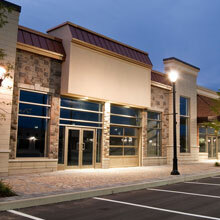 Investing in a storefront system demands precision measurements from an experienced technician. By choosing House of Glass, you get a team who has been around for a long time and knows how to quickly get the job done right. We are your local glass shop serving Newark, NJ. Our goal is to make all of our clients 100% satisfied no matter what it takes so you use us for all your future projects. Call today at 973-674-4228.